I know that I haven’t been blogging as much lately as I had been. The sumer has been moving along fast and I’ve been struggling to keep up. However I did find time to read a new collection of plays by Crystal Smith-Connelly. 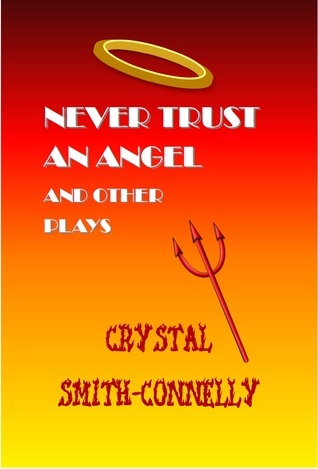 Never Trust An Angel and Other Plays is the latest anthology of short plays from Crystal Smith-Connelly. Smith-Connelly is a talented playwright whose previous work, For I Am Zeus, I really enjoyed. This collection is a little harder for me to judge because I don’t necessarily fit into her target audience with this one. This collection of plays reexamines and looks to rediscover the God of the Bible and look at him, his Son, his enemy, and his followers in a humorous light. As a person of faith and a humorist, I was intrigued by this idea. And for the most part it worked. I wasn’t as impressed by the overall work as I was by her previous work, simply because it seems to me at times the character of God comes across as Zeus from her previous work. I would have liked to have seen a little different character development there. However the characters of Jesus and Satan are well defined and make up for God. If the collection had focused more on these characters and less on the God/Zeus hybrid, I think I would have enjoyed this work a lot more and would have given it a higher rating. Yes the play could be argued as being “sacrilegious” but I believe that God isn’t just the creator of the world, but the creator of comedy and at times, we need to poke a little fun at ourselves. In one short play, Messiah Island, is a great look at two different kinds of people who are competing for the role of Messiah via reality television; the hyper-religious and the doing it for the fame. In my opinion, this is the strongest play out of the bunch because it deals directly with God and his followers, something I would have liked to have seen more from. Overall, this is a strong work and one I would imagine works very well on the stage, I just wish that Smith-Connelly would have branched out a little more in her characterization of God and made him less Zeus like and Zeus-lite. Never Trust An Angel And Other Plays is now available for purchase through Amazon as a paper-bound book or a Kindle edition. For more information on Crystal Smith-Connelly, you can check out her Facebook page or her webpage.